10 Inverse Femtobarns: Celebration Time At Fermilab! As sure as death and taxes, and as timely as a Swiss watch, the Tevatron collider never ceases to awe us. Well into its twentysixth year of life, the aged and celebrated proton-antiproton collider sitting just a few meters underground in the west Chicago suburbs hit the mark of 10 inverse femtobarns of collisions delivered to the core of the CDF and DZERO detectors. 10 inverse femtobarns! Ten inverse femtobarns of proton-antiproton collisions is a HELL of a lot of them. Plus, you should multiply that number by two, since the same number of collisions happened inside two different collision areas -those manned by the two competing collaborations. If you need a measure of what 20 inverse femtobarns of collisions mean, walk to the beach. A mile-long stretch of sand, extending 100 meters into the land and with a depth of one meter, contains roughly the same number of sand grains as that number of collisions. Absolutely awesome. On the other hand, if you were downplaying it, you could shrug your shoulders and claim that the total mass of annihilated protons would just make a picogram of matter. Protons are tiny, but we need lots of them to study subnuclear matter! 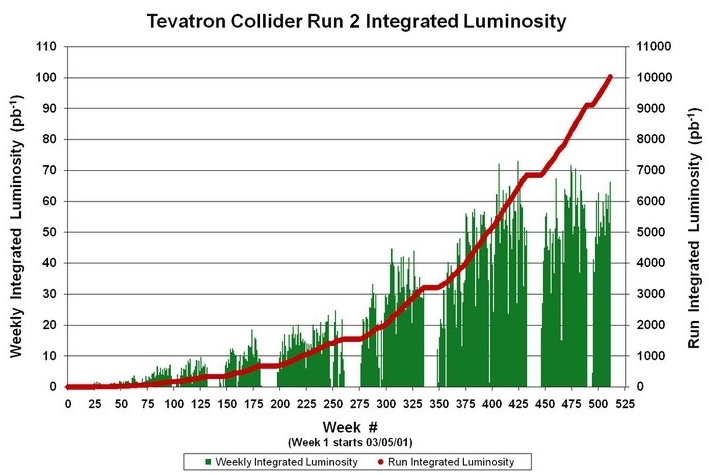 The graph below shows very clearly the progress of Tevatron data collection in the course of the last ten years. In red you can see the integrated luminosity, which should be read off on the axis on the right; in green the thin bars show the weekly integrated luminosity, which describes how the accumulation rate has increased for many years, and now stabilized to roughly 55 inverse picobarns per week. Another way to picture what do 20 inverse femtobarns of data mean is to make simple calculations. Take the Z boson, the carrier of neutral weak currents that Carlo Rubbia in 1983 extracted with a lot of sweating from the lower energy and lower intensity SppS collider (five events in total, if I remember correctly, were all it took him to claim the discovery of that new boson, which together with the W boson signal allowed him to secure a Nobel Prize in Physics). The Z boson at the Tevatron has a production cross section of about 8 nanobarns: since 2002 the Tevatron has therefore created in the core of CDF and DZERO a total of such particles. The Tevatron might end its operations in less than one year, or continue to run until the end of 2014. Its future is in the hands of philanthropists. If you are sitting on a pile of cash, consider donating 150 million dollars for a just cause.